St. Joseph Group of Institutions has carved a niche for themselves and is a renowned name in the field of education for the last 28 years. It is known for imparting Quality education and striving for excellence thereby producing outstanding results in education and sports. We have been doing Yeomen Service by making students into worthy citizens who are morally upright and doing extremely well for themselves. St. Joseph Inter College, the dream child of Mrs. Pushplata Agarwal is the epitome of her commitment and dedication to provide affordable and quality education to the Indian society. This eventful journey started almost three decades back on 14th April, 1987 with a small group of 135 eager pupils and an enormously ambitious vision of the founder. So focused and resolute was her approach that during this short span, the institution successfully overcame formidable barriers to come out with flying colors and make a mark of its presence on the horizon of city’s educational landscape. The illuminative and philosophical leadership has guided the highly skilled and motivated teaching faculty to help deliver meaningful education to the pupils of the institution. In such a short span of time the institution boasts to have risen to strength of over 5,200 students at the end of the academic session 2012-2013, seeking education with an objective of becoming a responsible member of the society. Mrs. Pushplata Agarwal, inspired by her daughter “Neeru”, laid the foundation in her fond memory with the sole objective to impart purposeful education to one and all. Under the aegis of this society St.Joseph Mont. / Inter College, the institution was established. 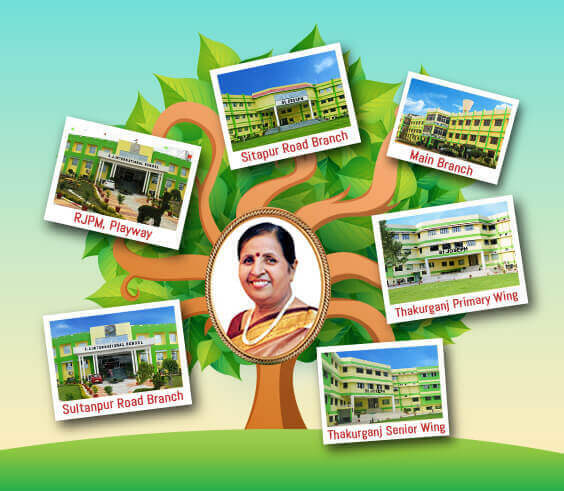 The first branch started from Rajajipuram in the name of St. Joseph School in the year of 1987. This was followed by St. Joseph Inter College at Thakurganj in 2004 and St. Joseph Playway Rajajipuram in 2005 and extending the remarkable journey of success, now a new branch equipped with international facilities is going to be opened shortly at Ansal’s API Sushant Golf City, Sultanpur Road, Lucknow. Our students have not only excelled academically but also did brilliantly by winning laurels in Republic Day parade, annual sports activities of the institution and other cultural events held over the years. They have brought glory and fame to themselves as well as to the institution by winning laurels and performing magnificently. St. Joseph Montessori School laid its foundation on 14th April 1987 with 135 students till class 5 and followed state board curricular at nearly built colony of Rajajipuram, Lucknow. Soon it became a renowned name in area and there after we never looked back. Today this main branch of St. Joseph group of institution caters to the educational under of approximately 2500 students in ICSE,ISC and UP Board. St. Joseph Inter College Thakurganj came in to existence in 2004 keeping in mind a section of society where good education is not early reachable. The old areas of Thakurganj & nearby villages found the solution to their biggest problem and school had a rapid grow the graph and following year of its existence. Following ICSC & ISC the school today has 2836 students and is soon going to have a brand new building to give best of facilities to the students.